I've heard it said, several times before, that what we see today is the result of the decisions we made in the past. 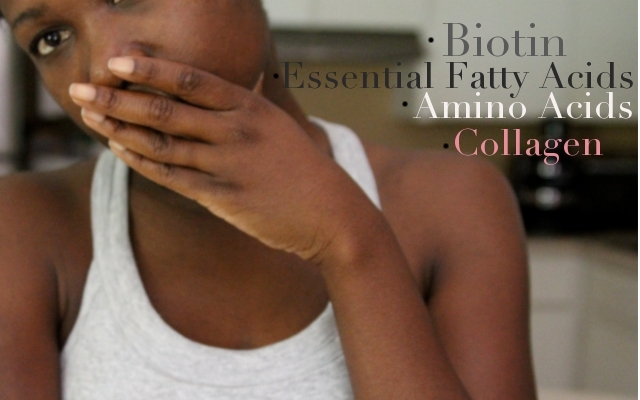 How we cared for our hair, our bodies, our finances in the past is visible to us right now. If, months ago, we decided to work out consistently, we'd be experiencing a fitter body today. For this reason, I've decided to up my supplementation game. Winter is around the corner and (much like a polar bear who stocks up on fatty fish for hibernation season) I want to be prepared. You might have remembered this post depicting the growth cycles of our hair during the various seasons of the year. Fall and winter are the two seasons where growth slows and shedding increases. Three months from now, I want to be sprouting healthy, vibrant hair. That's where the GNC Hair Skin and Nails program steps in. I've had a pretty stressful last few months and I can clearly see where this has taken a toll on my hair and my overall appearance. I'm so ready now to make a positive effort to shift my current reality. 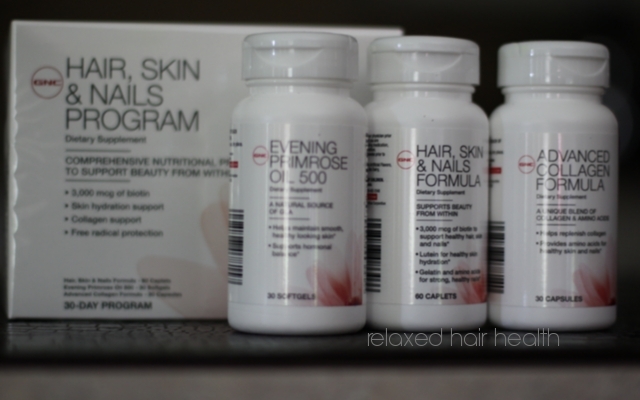 The hair skin and nails program was highly attractive to me because it's a "program". In one box, I get an entire system that includes Evening Primrose Oil, Collagen for healthy skin, and the Hair Skin and Nails formula. One week has passed since I bought this and so far I haven't missed one day. I think it has something to do with the fact that we get enough product to last a full 30 days. I feel like I shouldn't miss one day while on the "program"which motivates me to stay consistent. There just so happened to be a buy one get one 50% off sale so I picked up two boxes. I'll probably pick up another box because I want to go at least a full 90 days (at least) to receive the full benefits. It also helps that these pills are really easy to take. They aren't the gigantic horse pills I remember taking years ago when I tried the Ultra Nourish Hair. I didn't really get this for hair growth. My true intention was to impact my nails and lashes. Honestly, I've never been able to get my nails to the level they were when I "rubbed" consistently. They grow, then they break. The length you see in the picture above is right about where I typically land. I'd like to have strong healthy nails all the freakin' time! Oh, and don't get me started about my non-existent lashes. I would give up a couple inches of hair just to have full, lengthy lashes. The shots below are kinda like my "before" shots. Actually, they are longer than they've been in the past (pathetic huh?) I'm riding the wave of my newly visible lashes with nutritional support and we'll see what happens. There's also the stress that I have to deal with. For the past few months, my thinking hasn't been as powerful as it could be and I know that it's taken its toll on me. Incorporating exercise back into my life should help but I have to take a more active role in creating the ideal environment and the results I desire. Three months from now, we'll be in mid November. The weather will have changed, time will have passed, and I'll be glad I made the decisions I did today. Its believed that your skin, especially the nails is a reflection of your inner health.. I would like to read further reviews on this program and I hope you get your desired results. Will be interested in hearing how this works for you. I use their Ultra Nourish Hair because it felt like the Hair Skin and Nails made me break out more. Was weird but helped my hair. I like the product I'm using but maybe the combo is better. 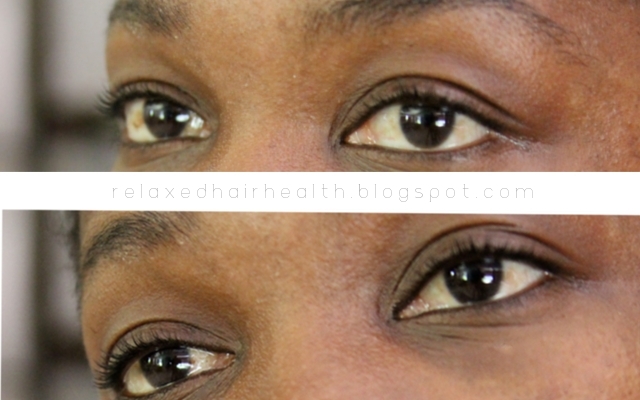 its funny you did this blog, i have their hns formula, just the one though, but i swear the only hair it helped me grow were my lashes, other than that nada....i'm switching to naturegrade hns after this, with that i saw actual growth in my hair. Thank you for sharing this.Nice post. and content is very useful. What if any changes have you noticed since starting this program? Is it too soon to tell? Great question Anon. Since writing this post, I have been taking some form of a healthy hair vitamin almost daily. My nails are usually the first area to benefit. Right now, my nails are strong. Also my eyelashes are doing pretty well. My new growth is thriving even though I touched up not too long ago. Things are going well. Hey! Would you recommend it now?? Hey Denys. I don't take it anymore but it was a good brand. I found that my nails & lashes grew more with drinking lots of bamboo tea.